No I haven’t been back to New York -I’m still trying to get caught up on all the things I did while there way back in late October! In earlier posts I may have mentioned that M and I were staying in an apartment on the Lower East Side – living like locals! We happened to be staying just a few blocks from one of the latest neighborhoods starting to become "the" place to go. Sort of like the Meatpacking district was, maybe ten years ago. Rivington Street is the heart of this resurgence and you’ll find all kinds of interesting restaurants and bars either already firmly established or opening their doors. On my first night in town (M arrived in town before me) we decided to take a little tour of the local scene. Our first stop was Thor, located in the Hotel on Rivington. The name is actually the acronym for The Hotel on Rivington but brings to mind Nordic times and the clean lines of the room and decor support this idea. Although the entry way is rather odd and makes you feel a little like you are entering some Alice in Wonderland rabbit hole. We arrived early – at least by New York standards – and joined just a few others in the bar/lounge area of the restaurant. While sitting at the bar we chatted with the friendly bartender about other up and coming places in the neighborhood. 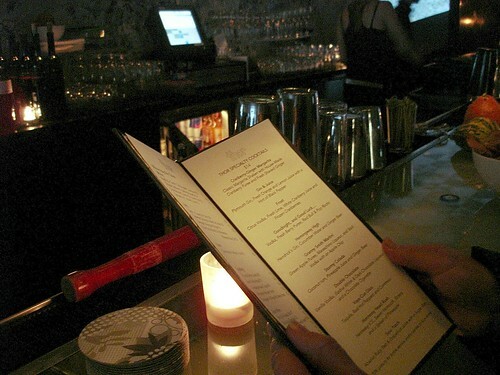 Since we had plans to try a few places that night we kept our order fairly simple – a bowl of delicious house-made potato chips; a charcuterie plate and a couple of cocktails. I ordered a "Gin and Juice", which was basically a twist on an Orange Blossom. Fresh-squeezed orange and lemon juices blended with gin and topped with a little black pepper. That little spice on the top was really nice. 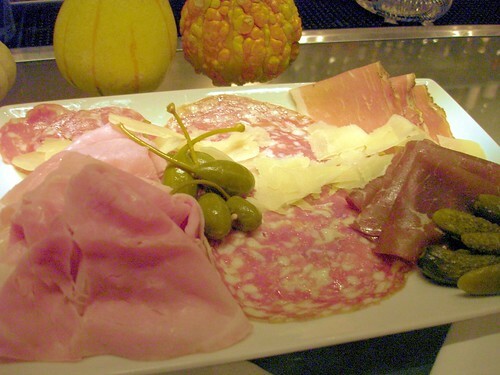 The charcuterie platter was a nice selection of six meats, pieces of Parmesan cheese, cornichons and caper berries. It was a fun, quiet start to our evening. I have a feeling that later in the evening the place would be much more lively and can imagine groups of friends draped along the low couches in the lounge area. At that point it might not be the place for quiet conversation but would certainly be an entertaining place to be! There are so many great places in New York that I can’t say if I’ll ever make it back here again, but I do know if I was in the area I’d certainly be interested in stopping in, checking out a few more things on the menu and chatting with both locals and hotel guests who frequent the bar.